While visiting Santa Monica we had to visit the famous landmark, Santa Monica Pier. 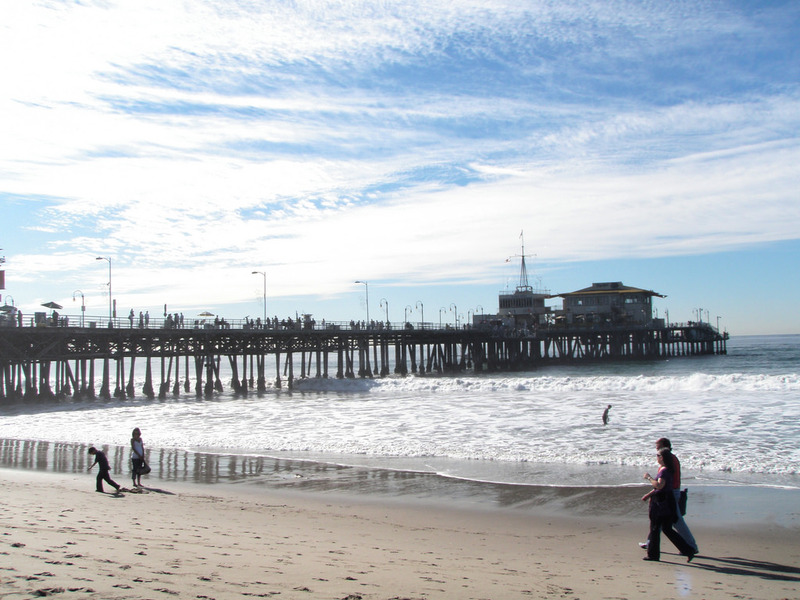 The pier dates back to 1909, where it was originally built to carry sewer pipes past the breakers… gross. The second part of the pier was built in 1916 and referred to as the Pleasure Pier. Although the name invokes another form of grossness, the pier was built for the amusement park attractions: the wooden roller coaster, The Whip, a merry-go-around and a fun house. The attractions may have changed over the years but what I hope most is that people have stopped calling it the Pleasure Pier. I know, my mind is in the gutter. But seriously they couldn’t call it something better? Anyway. Our visit to the pier was short and sweet. 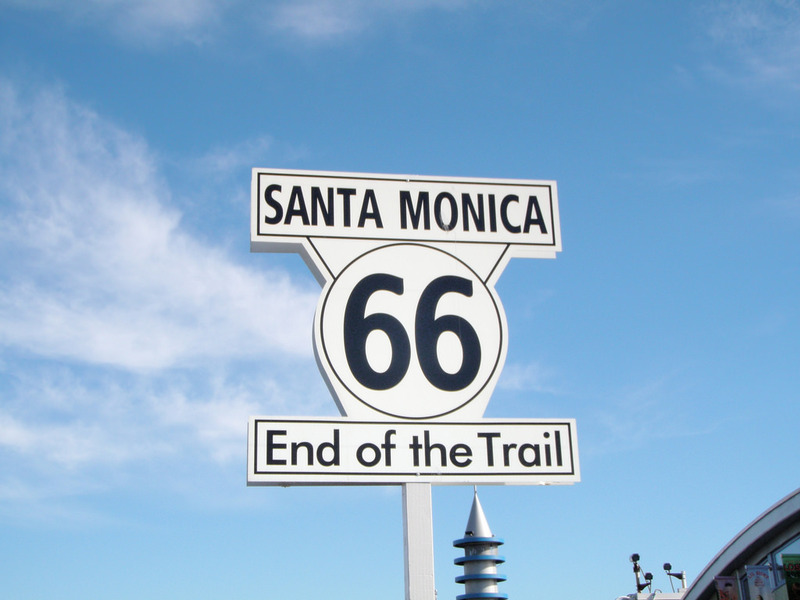 It was a nice sunny day to be standing at the official end of Route 66. 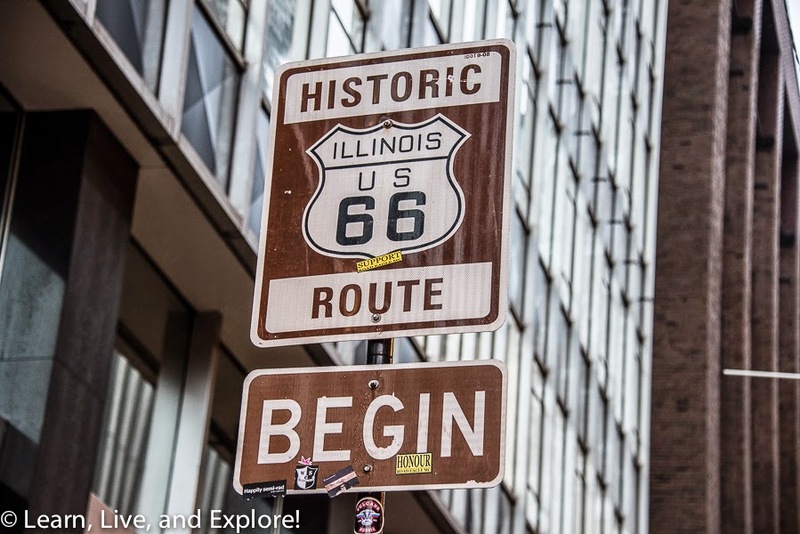 Unfortunately while in Chicago last year (the other end of Route 66) I did not capture a photo of the sign, even though I passed it a few times and never snapped a photo. It is not really life changing to have that photo but it still would have been fun to have photos of both ends of the highway. I have dreams of driving Route 66 one day. It sounds like a fun road trip for Boomer and I to take one day! Laura and I walked around the pier taking in the sites. 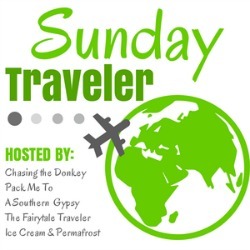 It was January so none of the amusement rides were open, although we are both prone to motion sickness, so a ride on the roller coaster or Ferris wheel would most likely be out of the question. We sound like a fun bunch, don’t we? 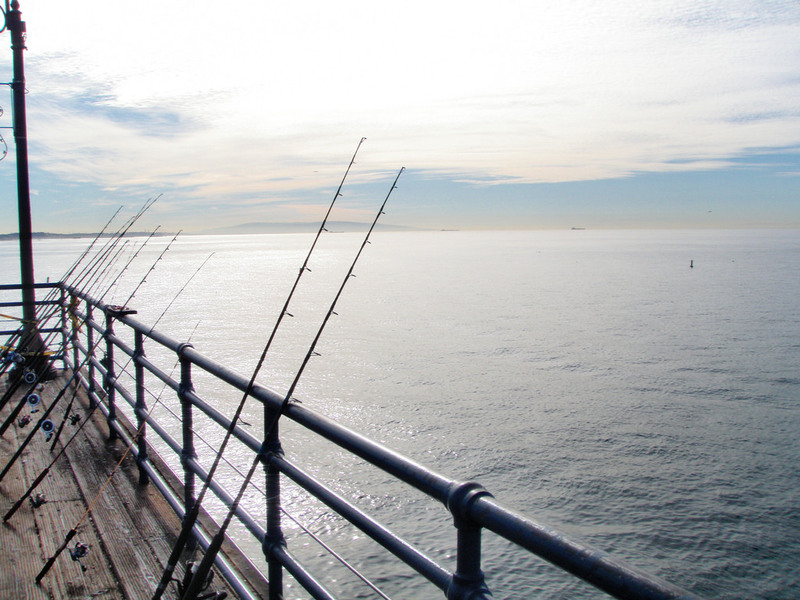 As we came to the end of the pier we found several people fishing. Interestingly enough fishing is quite popular here and does not require a fishing license. You will find Perch, Mackerel, White Sea Bass, Leopard Shark, Tiger Shark and Sting Rays. I’d like to not catch the last 3. The pier has several food vendors to choose from. The food consists mostly of seafood options, which is not really surprising considering it’s location. We stopped in at Mariasol Cocina Mexicana for some food and drinks. We were on our way to Mexico so perhaps we were prepping ourselves for what was to come. This restaurant does have the best views of the ocean as it is located at the end of the pier and has a clear shot out into the ocean. 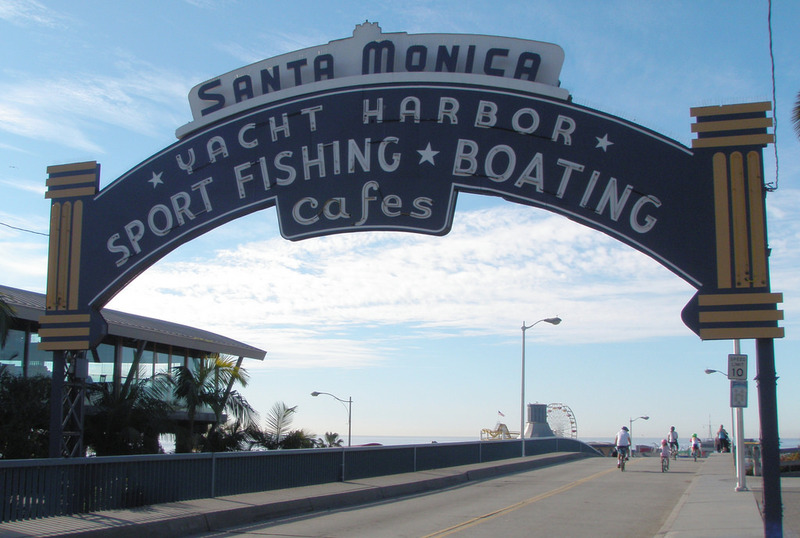 There are also a few clothing and trinket shops as well as bicycle and fishing pole rentals shops, the Santa Monica Pier Aquarium and for the daring a trapeze school. You can probably guess that Laura and I also skipped the trapeze school due to our motion sickness problems! The pier is as touristy as it gets but it is still a fun experience. Because of the tourists (us included) we did have to stand in line to take a photo of the famous Santa Monica Pier arched sign. There is also easy access to the beach, which our visit in January was not necessarily the best season for a swim. 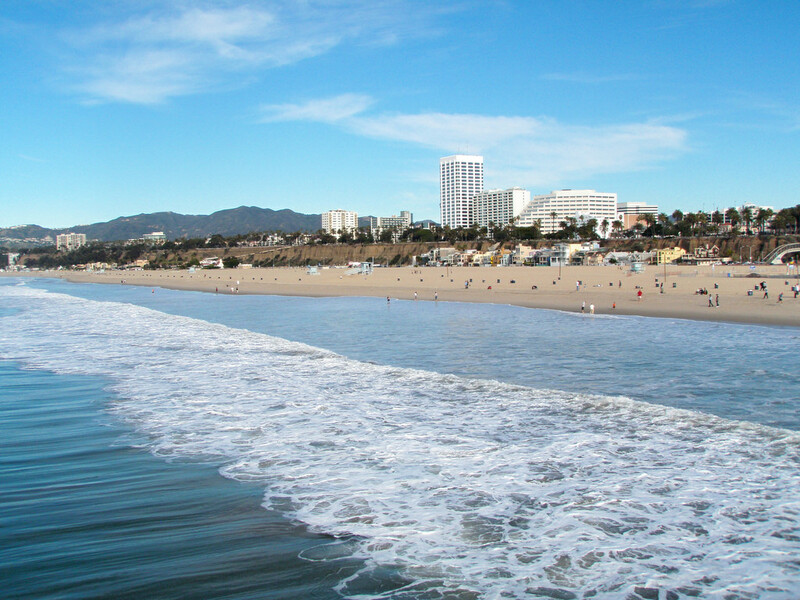 The Pacific Ocean temperature in Santa Monica rarely gets over 68F in the hottest months. 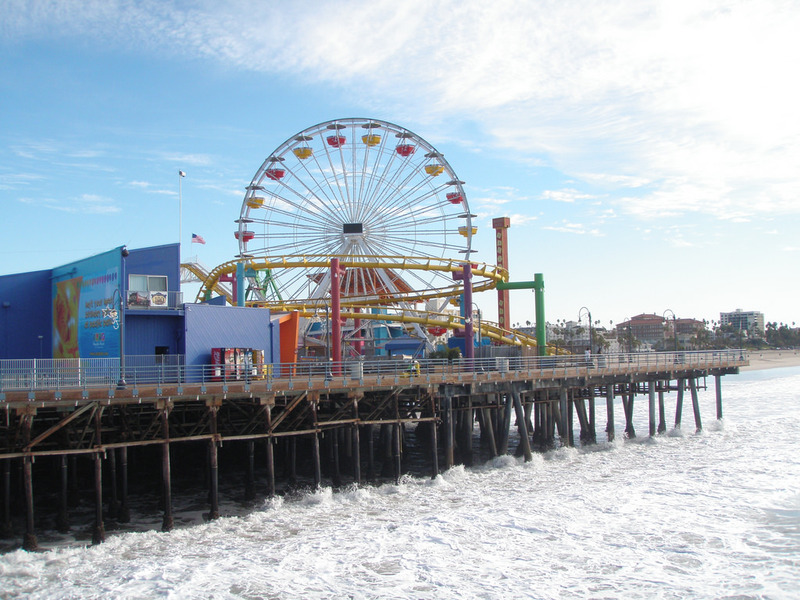 The Santa Monica Pier is located at 200 Santa Monica Pier, Santa Monica CA 90401. The pier is open 24 hours a day 7 days a week. There is no fee to enter the pier but there is paid parking that is by the hour or flat fee spots. Here is a borrowed one. yes that’s the one I saw! I did not but I will have to next time! Thanks for the tip! I live in San Diego and used to live in L.A. as a kid. This is the first time I have ever seen Santa Monica Pier referred to as “Pleasure Pier.” UGH that is awful, but I am pretty sure people no longer call it that! I’m glad the pleasure pier name didn’t catch on! It looks pretty interesting, especially because it has a nice sandy beach without too many rocks. I bet that your dog had a wonderful time there. The beach is nice! Boomer always does like access to the water – he’s my water dog!